KGCCI Sec. 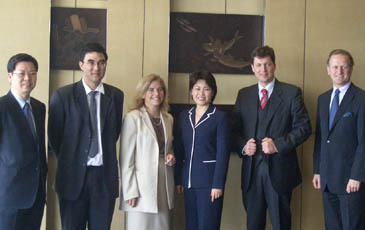 Gen. Wolfgang Niedermark (2nd from right), poses with EUCCK Vice President Peter F. Thewlis (right), EU's Deputy Head of Mission Maria Castillo Fernandez (3rd from left), Prof. Choi Sun-Mee (3rd from right) of Yonsei Univ. at Hyatt Hotel April 12, 2006. Doing business in Korea will be easier for EU managers thanks to the European Executive Training Programme Korea (ETP). 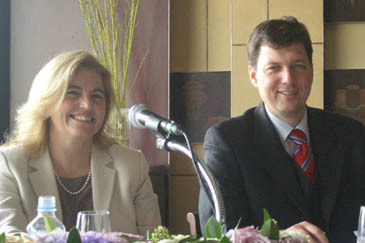 The new ETP was promoted on April 12, 2006 at Grand Hyatt Hotel in Seoul in the presence of representatives of the European Commision, EU-country embassies in Korea, Korean economic organisations and journalists. In order to better serve the interests of EU companies, a consortium of internationally recognized universities has been founded with the support of a network of bilateral Chambers. Business is a question of understanding not only rules of the economy, but also cultural sensitivities. In this respect, ETP focuses on intensive language courses, the way of life and business cultures of the Korean economy. The new ETP partners are high level universities such as Science Po (Paris); the School of Oriental and African Studies (SOAS, University of London), Bocconi School of Management (Milan) and Yonsei (Seoul). KGCCI Sec. Gen. Wolfgang Niedermark (right) poses with EU's Deputy Head of Mission Maria Castillo Fernandez. ETP Korea offers EU business leaders the opportunity to receive a three-month training in the EU and spend nine months in Korea, including an internship in a local company to learn how to develop business relations with these countries. The commercial opportunities are significant: Korea is the EU's eighth largest non-European trade partner. The EU is also one of the largest foreign investors in Korea. Mr. Adjemian (Veolia ), who participated in the ETP Korea last year, stated that this programme was not only a big success for his company but he also enjoyed his time spent with the programme very much.